Mohamed Karmoune, the Moroccan consul in New York, had to leave for a special government mission to Florida this past Tuesday. Despite his hectic schedule in preparing for his trip, Mr. Karmoune took time off to call the Matusof children who are sitting Shiva for their mother, who passed away early last week at the age of 86. Rabbi Shlomo and Pessia Matusof were the first Shluchim sent by the Rebbe in 1950 with the mission to revitalize and save Moroccan Jewry. At the time of their arrival, there were approximately 400,000 Jews living there. Over the course of years, the Matusof's established a network of more than 70 day schools and Talmud Torah's throughout Morocco under the name 'Mosdot Oholei Yosef Yitzchok', named after the Previous Lubavitcher Rebbe, Rabbi YY Schneerson who had instructed his son-in-law and future leader of Chabad to send the Matusof's to Morocco just before his passing on 10 Shvat 5710. As the Jewish communities in Morocco dwindled with many Jews leaving to Israel and France, the Matusof's established two large separate boys and girls schools in Casablanca with dormitory facilities to accommodate students from other cities who wished to learn by them. Mrs. Matusof was the Director and Head Principal of the girls school, Beth Rivkah, and from the years 5710 - 5752, she educated tens of thousands of students who went on to become Jewish mothers, educators, and even Shluchot of the Rebbe throughout the world. Even after moving to New York with her late husband in 1992 for medical reasons, Mrs. Matusof continued to stay in touch with her students and staff and kept track of the personal Simchat and tragedies as well of all her former students. On any given day, she would receive dozens of calls from students and friends from Israel, France, Montreal, Morocco and the United States who wished to stay in touch with her and benefit from her caring and individualized approach to each person, filled with genuine love and compassion. Upon the passing of her late husband 3 years ago, the Consul general of Morocco in New York, Mr. Mohamed Karmoune, paid a personal visit to the Matusof home and spoke with Mrs. Matusof and her children. 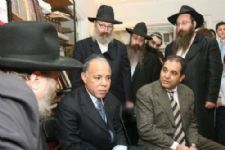 When Mr. Karmoune was informed of Mrs. Matusof's passing by his good friend, Mr. Maurice Perez, Vice President and Director of the Netivot Israel Congregation in New York, he immediately called Rabbi Eliezer Avtzon, a nephew of the late Matusof's to convey his condolences and apologized for not being able to come to their home as he had to leave within a few hours on an official trip to Florida. Rabbi Avtzon, who was in his office at the time, explained that he was not at the Matusof home, and offered to call the Consul General back when he would be with the family. Mr. Karmoune explained that he was late in getting ready to depart for the airport and asked instead if he could please call back in a short time as he very much wanted to personally speak with the family. Five minutes later, Rabbi Avtzon was at the Matusof home and within a minute or two, the phone rang and Mr. Karmoune was on the speakerphone speaking with all the children. After conveying his condolences, Rabbi Yosef Yitzchok Matusof, head Shliach of the Rebbe to Toulouse, France and Rabbi Shmaryahu Matusof, a Mashpia in the Lubavitch Yeshiva in Brunoy, France, both spoke with the Consul General and expressed their appreciation for his call and conveyed their blessings to him, the Moroccan people and in particular to His Majesty, King Mohamed VI, for his outreach, love and compassion to the Jewish communities of Morocco, as well as to Moroccan Jews who have even left Morocco and settled in other parts of the world. 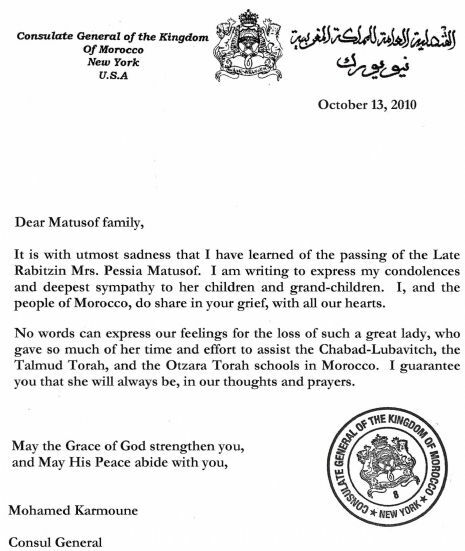 As he was traveling to the airport, Mr. Karmoune dictated a condolence letter to his associate which was sent that same day to the family, expressing his condolences and appreciation on behalf of the entire Moroccan Community for the accomplishments of this great woman and Chabad Lubavitch movement. קונסול מרוקו הפתיע: "חב"ד עזרה למדינה שלי"